The new rules come after a motion by the Lesbian, Gay, Bisexual, Trans and Queer society (LGBTQ Soc) was passed by the students' union earlier this year. The changes, to start from 4 August, have now been agreed by the university. Jess Pumphrey, LGBTQ officer, said the change would make a number of students' exam experience significantly less stressful. Under the old laws on academic clothing - known as subfusc - male students were required to wear a dark suit and socks, black shoes, a white bow tie and a plain white shirt and collar under their black gowns. 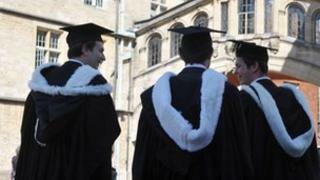 An Oxford University spokesman said: "The regulations have been amended to remove any reference to gender, in response to concerns raised by Oxford University Student Union that the existing regulations did not serve the interests of transgender students."